Combine all the liquids - I use a 1 cup measure in which I whisk the eggs before adding the rest, and this allows me to add the rum orange essence and milk to make exactly a cup - and place in machine, followed by the dry ingredients (minus raisins) and oil or butter, with the yeast going in last and on top of all else. 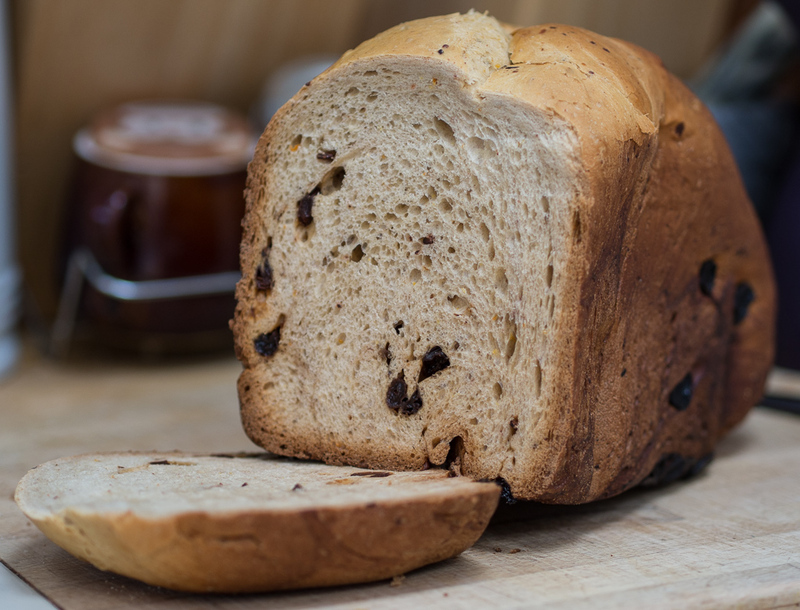 My machine requires me set it to a 'Basic' recipe for fruit loaves, and I add the raisins at the Beeping-that-happens-when-you-should-add-stuff. The rum they were soaked in? Chuck it in if you judge the dough to need more liquid, or simply swallow it if all is going well. The loaf is tall, elastic and tastes authentic. I would have sworn there was marzipan in panettone, but it turns out the flavour is the mix of orange and cloves. I haven't any photos of it so far, but I'll make it again in the next few days and be sure to take a photo. Exactly, but one should know how to at least once to appreciate it fully. It's awfully tasty. Indeed it is! I'm amazed that one can turn out such a loaf at home with so little effort. I'm salivating! I can taste it from here but without the calories. We too have been fiddling with our bread machine in hopes of replacing store bought Panattone. So many of them are quite terrible, and the better ones cost a small fortune on the Prairies. Mrs. Zero and I got hooked on Panettone when one of my previous customers began to give me one each Christmas, and being from Italy, he refused to scrimp, and ordered only the finest from some Italian importer. Zoom forward to today where I no longer have Serafino as my customer (we are still good friends and we both love shaving stuff), and so I needed to find or make something myself. I just finished giving your recipe a whirl, and it is very nice. In our case, we cut back the amount of cloves to 1/2 tsp and added 1/3 cup of currants and a 1/4 cup of candied orange peel (the rum was replaced with Brandy, it was all I had). All in all a terrific substitute for imported Panettone, and one that we can now make at any time of year, not just for Christmas. kaptain_zero wrote: We too have been fiddling with our bread machine in hopes of replacing store bought Panattone. So many of them are quite terrible, and the better ones cost a small fortune on the Prairies. What recipes have you tried? Have you looked at any of the recipes on The Fresh Loaf? Made it last night,tampered with your recipe a little bit,results are fantastic!...Soaked chopped dried black figs,medjool dates and Afghani raisins in 1/8th cup Four Roses yellow label Bourbon for a week.Used half organic whole wheat pastry flour ,half organic unbleached wheat flour...1/4 tsp Princess flavoring ,1/4 tsp. anise powder,1/8th tsp cloves ,zest of 2 fresh tangelos..Not quite as light and fluffy as traditional loaves,but the taste and wonderful scent were as good or better.I used sunflower oil,maybe next loaf I'll try it with a nice Irish or Finnish butter.....Thanks for the recipe ! A bottle of that stuff and I don't care what else is in the Panettone! I do not know why, but I've succumbed to the Jnat hysteria and chosen a hone that I will purchase shortly. I really should focus on Panettone instead, it's cheaper and much tastier. Too late now, Christmas is over! I know it's hard to believe, but Xmas 2016 is just around the corner and I get to dust off your very fine Panettone recipe! I'm kind of depressed now that my blood tests are indicating I'm pre-diabetic, but for a good piece of Panettone... it'll be worth it! All the cakes, cookies and chocolates have been cancelled, but this recipe stays! Ooh.... I forgot I'm fresh out of Bourbon.... must fix that tomorrow. The wife and I were discussing Potica this last weekend. I might also give panettone a try this year. We don't need the calories, but it sure is good! It's also not year round. To quote my dad: "It's not what you eat between Christmas and New Years that causes weight gain, it's what you eat between New Years and Christmas!" Good luck with the recipe. I'm afraid I won't be making it this year as my sone won't be home for Christmas. On the other hand, you could ditch that smoked mackerel and give the Norwegian treat "Lutefisk" a go.... Good old cod, soaked in lye until it turns into a jello like state when cooked, and tastes like soap... all you need is lots and lots of melted butter to make it go down. And go figure... I can buy Lutefisk locally! I may have grown up in Norway, but there is a reason why one of my T-shirts says: "Lutefisk. Bad to the bone!" Here in south Texas at this time of year we enjoy the return of thousands of "Winter Texans". They come down from the Dakotas, Minnesota, Iowa, Wisconsin, and so on to spend the winter in our warm weather. Our church youth group hosts a lutefisk dinner as a fundraiser each year and serves about 600 meals. The folks from up north really enjoy it. One can actually buy lutefisk in the local supermarket in the Rio Grande Valley of Texas! Who knew? Another survival food (IMO) are canned smoked kippers (large sardines aka herring). Just delicious, but it's an acquired taste. I love the things. Canned sardines are in that category too; delicious, even if a bit mild in flavor. I absolutely love pickled herring and I generally order a few gallons from the Great Lakes every winter. Dang! I'm salivating at the thought. I'd buy Maine pickled herring but it just isn't "right" and I can't get it in large enough jars for economy. I can go through a lot of pickled herring. Still salivating. Yeah, it's time to place my first order for pickled herring. Kippers are magical breakfast food, traditionally in Scotland with a dollop of gooseberry jam and a glass of scotch. Smoke or pickle your herrings, but for goodness sake keep away from the evil brined version - the bloater. Like eating wet cardboard.